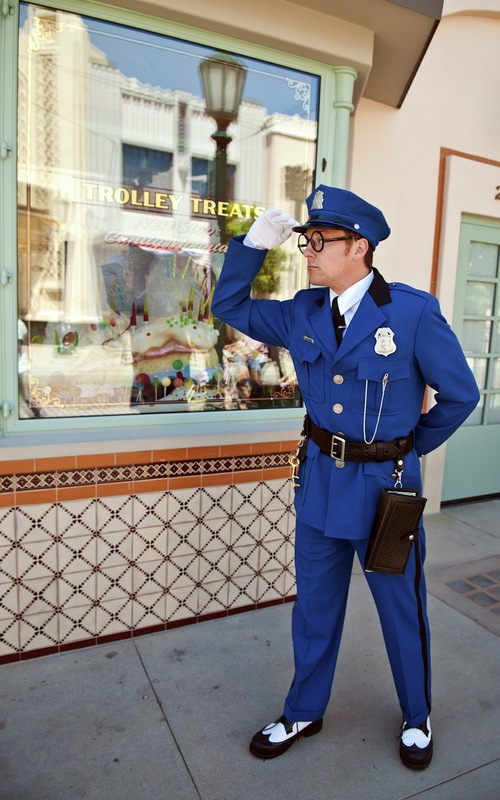 This is the first in a series that will focus on the characters of Buena Vista Street. Officer Blue flashes a smile. It's much more disarming than a badge! It's not hard to spot Buena Vista Street's resident lawman. He's the one who's completely blue! Don't worry, though, this policeman isn't sad. 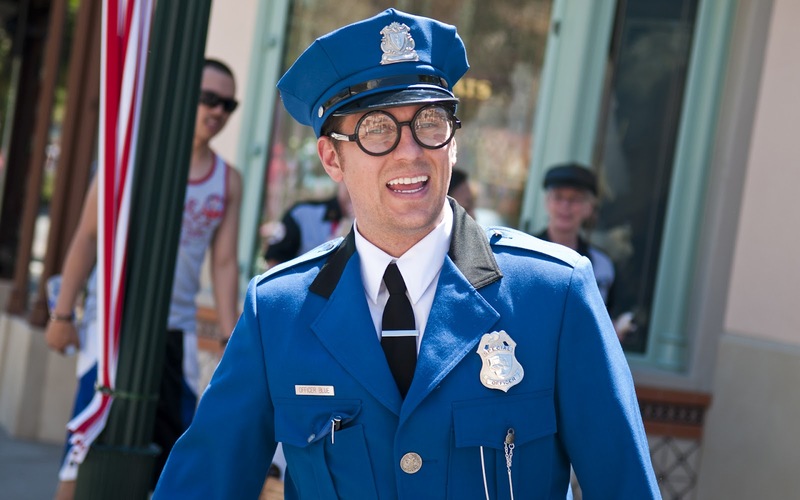 In fact, quite the opposite--Officer Calvin Blue is perhaps the most jovial regular in the neighborhood! Every day, he can be spotted patrolling the streets, riding the Red Car Trolley, and handing out good behavior citations. In fact, not a day goes by where he's not almost running out of them! Officer Blue strikes a pose. 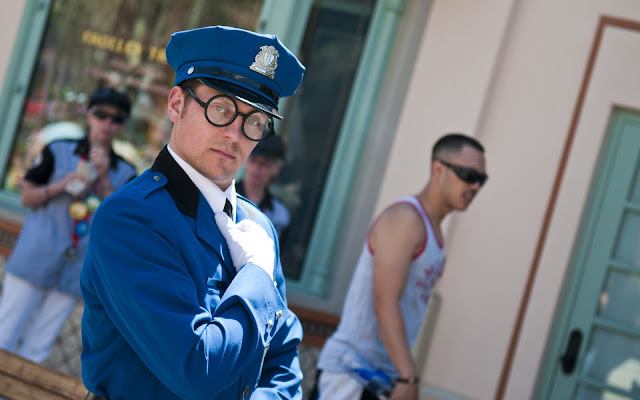 Officer Blue is just one of several regulars around Buena Vista Street. But in his blue pants and jacket, he is perhaps the most formal-looking of the bunch. And he's always good natured and quite approachable. So if you're looking to be ticketed for being a nice guy, just stop him for a chat. Cuz it's good news for you, when you meet Officer Blue! Officer Blue on the lookout. 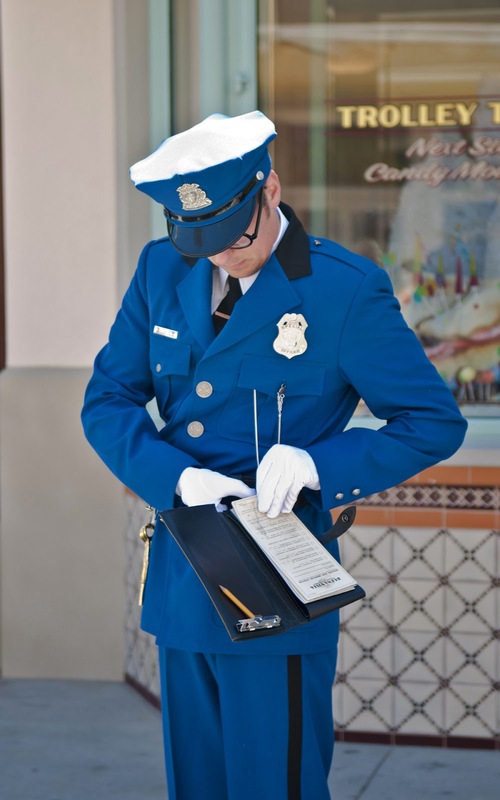 Officer Blue writing a good citation. Do they have one at the Orlando park? I'd love for Laura to get a good citation while we're on our honeymoon! I'm relatively sure he's unique to DCA, but I'm pretty sure Hollywood Studios has street characters as well and maybe someone playing an equivalent role?